IRVINE, Calif. (Dec. 10, 2007) - Building upon its award-winning legacy of Tablet PCs, Toshiba's Digital Products Division, a division of Toshiba America Information Systems, Inc., today announced the Portégé® M700 Tablet PC series. The Portégé M700 is the company's first Tablet PC to incorporate a touch screen LED backlit display. As the ninth generation of Toshiba's innovative Tablet PC product line, the Portégé M700 series offers enhanced versatility, performance and productivity to attend to the needs of on-the-go professionals, "corridor warriors," educators and students. "Toshiba's Portégé M700 Tablet PC provides mobile professionals with an exceptionally intuitive Tablet PC to meet their mobile computing needs," said Jeff Barney, vice president of marketing, Digital Products Division, Toshiba America Information Systems, Inc. "Building upon many years of successful Toshiba Tablet PC platforms, the Portégé M700 incorporates our customer's most requested features resulting in Toshiba's most powerful and versatile Tablet PC to date." As Toshiba's first Tablet PC with a touch screen supporting both fingertip input capabilities and traditional pen-based input, Toshiba's Portégé M700 empowers users with a more flexible and convenient Tablet PC computing experience. The Portégé M700 detects the presence of a digital pen or a user's fingertip, automatically switching between the different input methods, with the digital pen given priority when both inputs are simultaneously detected. The Portégé M700 series incorporates an LED backlit display with anti-glare coating, which allows Toshiba's new Tablet PC to be viewed in a wide range of environments both indoors and outdoors. The LED backlit display produces superb image quality and rich color saturation indoors. While outdoors the anti-glare display delivers a clear, easy-to-view image. The resolution offered by the widescreen 12.1-inch WXGA display of Toshiba's Portégé M700 yields 30 percent more detail than a standard 12.1-inch XGA display. This affords users enhanced clarity for viewing multimedia files and multiple page documents side by side. The Portégé M700 Tablet PC display mirrors the layout of a standard sheet of paper when in portrait mode to give users a familiar writing workspace. The Portégé M700 series uses high-performance Intel® Centrino Pro processor1 technology, including Intel® Core™ 2 Duo Processors2, Intel® 965 Express chipset, Intel® Wireless Wi-Fi Link 4965AGN supporting draft 802.11n3, and Intel® Active Management Technology (AMT 2.6). Intel's AMT 2.6 delivers the ability to remotely deploy systems and supply proactive security and maintenance measures. This provides the network manager better control of mobile computing assets to minimize user downtime and provide greater efficiency at the office of when traveling. The Ultra SlimBay® on the Portégé M700 gives users the flexibility to change the configuration of the Tablet PC to adjust to their individual user needs. With support for an internal optical drive, second hard drive or weight saver, the Ultra SlimBay helps eliminate the bulk and inconvenience of carrying additional external components. The Portégé M700 comes with a DVD SuperMulti Drive4 and weight saver as part of the standard configuration. To simplify the transition from notebook computer to Tablet PC, the Portégé M700 design incorporates an improved hinge and display guide/peg mechanism as well as latch-less design to provide greater ease of use and industry leading stability. This combination of features ensures the display is securely locked into position in both notebook and Tablet PC mode. The inclusion of the latch-less design enables Toshiba to cleanly integrate a Webcam and microphone on the bezel of the Portégé M700. The 1.3 megapixel Webcam provides mobile professionals the flexibility to communicate face-to-face with colleagues, co-workers and loved ones when out of the office or traveling. The Portégé M700's Webcam can take still photos, record video clips and record audio notes. • HDD Protection—Because the hard disk drive (HDD) is one of the most critical Tablet PC components and that a dropped Tablet PC rarely falls in a single linear direction, Toshiba implemented the 3D accelerometer. This mechanism detects the acceleration caused by a sudden fall from multiple directions. The 3D accelerometer helps guard the HDD against awkward accidental drops, including a spinning, falling Tablet PC, by rapidly removing the HDD head from between the HDD platters, better protecting the Portégé M700 in all three rotational dimensions of pitch, roll and yaw. • Shock Absorbing Design6—The Portégé M700 Tablet PC features enhanced protection zones that run along all sides of the Tablet PC to help the Portégé M700 better withstand accidental drops. Toshiba also placed reinforced ribs within the rounded edges of the display to better protect critical components including the display and inverter by dissipating energy resulting from accidental bumps or drops. For further durability, Toshiba encased the display with magnesium alloy, a lightweight, rugged material utilized in structural, automotive, industrial and aerospace manufacturing. • Spill Resistant Keyboard7—Toshiba improved its spill resistant keyboard to help protect against accidental spills of water and other liquids, including soda and coffee with cream and sugar. This enhanced feature affords users time to save work and shut down the system in the event of an accidental spill — helping to prevent the loss of data. In addition to providing a reliable and secure mobile computing experience, Toshiba has incorporated several value-added features, including two "Sleep-and- Charge" USB ports. These ports allow users to charge compatible electronic devices, such as select cell phones or MP3 players whether the system is on or off. The Sleep and Charge USB ports eliminate the bulk and inconvenience of carrying extra chargers to recharge mobile devices. Toshiba's Portégé M700 is compatible with several Portégé M400 accessories including: Express Port Replicator, digital pen, reserve pen, battery and secondary battery. Complete product specifications for all the Portégé M700 models are available at www.sell.toshiba.com or www.toshibadirect.com. centralized depot for prompt turnaround service. Customers can also choose to upgrade the Portégé M700's service plans, including up to four years of extended warranty coverage. All new Toshiba notebooks and Tablet PCs are RoHS-compatible13, effectively reducing the environmental impact by restricting the use of lead, mercury and certain other hazardous substances. This coupled with a mercury-free LED backlit display has earned Toshiba's Portégé M700 the Green Electronics Council's Electronic Product Environmental Assessment Tool (EPEAT) gold status. To achieve this status, the Portégé M700 had to pass a strict set of criteria created to reduce the impact electronics have on the environment. 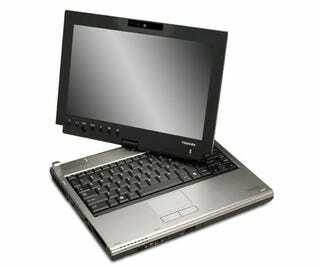 The Portégé M700 is Toshiba's sixth mobile computing solutions to earn the EPEAT gold status.